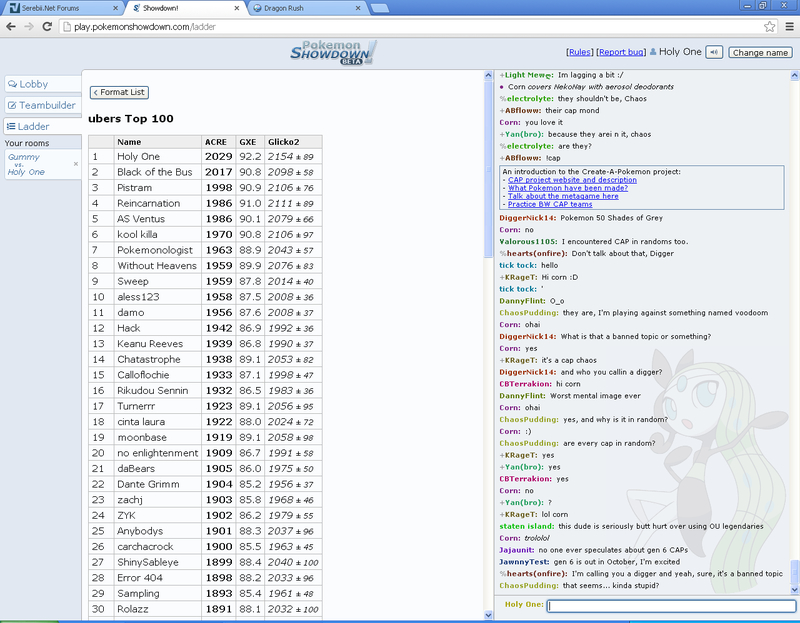 Because the worthless degenerates that moderate and/or administrate the Smogon forums and the Pokémon Online forums have decided to disrespectfully delete this Rate My Team thread from their sites for no good reason at all, I have decided to post it here as well as on the Serebii forums instead. 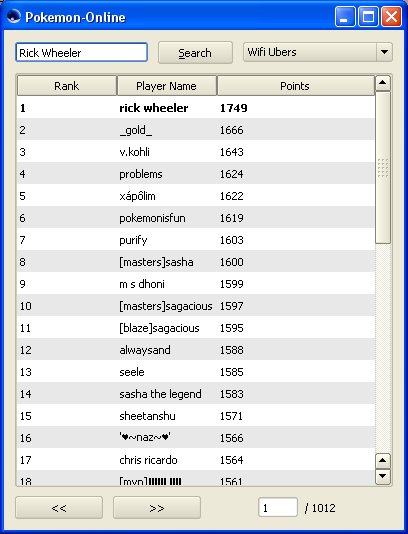 As I noticed that numerous people on Pokémon Showdown! have began copying and using this team for themselves, I have decided to make a Rate My Team thread featuring it, in order to prevent others from doing so and taking credit for my hard work. I was both confused and inspired by just how incredibly successful Alex Walls had been with this team despite its gigantic weakness to Kyogre, by far the most common Pokémon in the Übers tier if one were to count each type of Arceus as a separate Pokémon. When I was informed by the very creator of this team himself that the method to dealing with Kyogre involved a combination of the team's unbelievably high offensive presence, and switching a specially-defensive Groudon into a Water Spout in order to weaken the move's power with Drought, before immediately switching to a Choice Specs Reshiram on the second turn and then gaining offensive momentum by firing an incredibly powerful Choice Specs and Sun-boosted Blue Flare, I was absolutely amazed. All of my experiences participating in Übers battles up until that point had led me to believe that every successful Übers team must require a solid switch-in and check to Kyogre, no matter what. And upon seeing that someone was able to reach #1 on Pokémon Online's DW Ubers ladder with 1750 points using what appeared to be nothing more than a flimsy way of checking Kyogre, I was nothing short of completely awe-inspired by just how far sheer hyper-offensive pressure can get a team, even if it does not have a real check to what is one of the most threatening Pokémon in the entire game. And thus I was motivated to test the team for myself, and during that process, I gradually made several tweaks and modifications to its Pokémon's moves, EVs, Natures, and nicknames, and most notably, I replaced Reshiram with Kyurem-W in order to somewhat mitigate the team's massive weakness to Kyogre. Although my belief in the utmost importance of a team having a solid Kyogre check was still firm at that point, and I considered the possibility that the success enjoyed by my friend was to be attributed to nothing more than either a complete miracle or his inhumanly-high battling skills, I soon found that Alex Walls's, or at least after it had undergone several modifications, turned out to be one of the most successful Übers team I have ever known. Even though I did not build this team from scratch, the numerous modifications that I made to my friend's team were significant enough to allow it to be known as an original team. Inspired by a chapter title from my favorite manga series, Bleach, I decided to name this team The Blazing Glaciers. 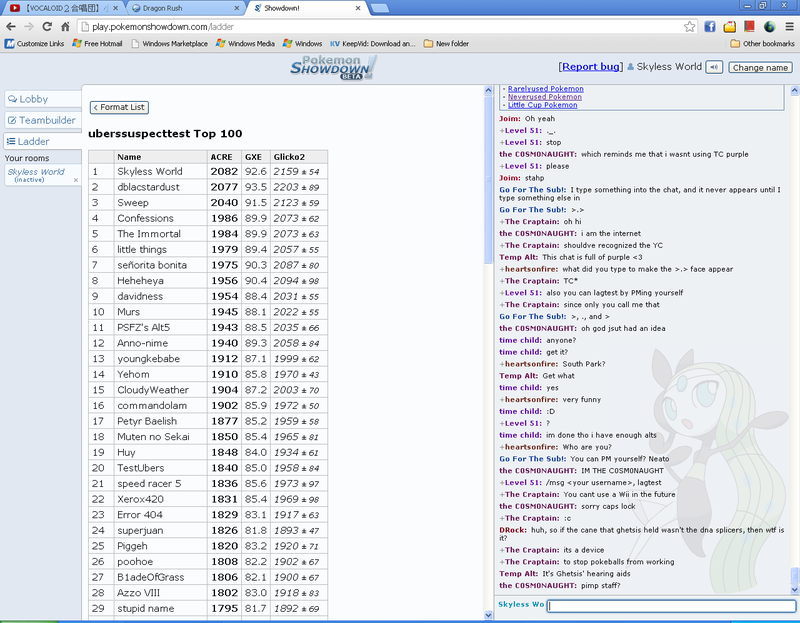 Almost one year ago, I created an Übers Rate My Team thread on the Pokémon Online forums that featured an Espeon. As what is perhaps my signature Pokémon in the Übers tier, due to it being probably the most common recurring member in countless Übers teams that I have created, and being easily one of the best and most underrated non-Über Pokémon in the Übers metagame, that very same Pokémon has returned to serve me once again. 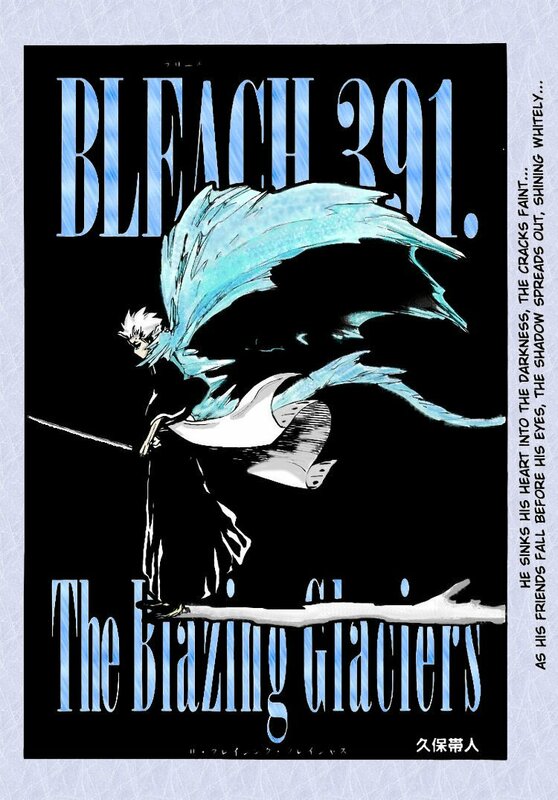 Blessed with the Ability to reflect entry hazards and status effects, it was given the nickname, Sōgyo no Kotowari, which is a Zanpakutou from Bleach capable of reflecting energy attacks of the enemy. Espeon is a great necessity to this team, considering the fact that of the other five members of the team, two of them are weak to Stealth Rock (including one with a 4x weakness to such), four of them are susceptible to both Spikes and Toxic Spikes, and none them are immune to Toxic. Although Xatu and Rapid Spin users such as Tentacruel and Forretress also theoretically help to serve Espeon's purpose, none of them are capable of taking Espeon's place on this team, as not only do none of those Pokémon possess anywhere near the amount of offensive presence that Espeon has, and would therefore lead to a great loss of momentum, which is extremely detrimental for a hyper-offensive team such as this one (for example, Xatu, Tentacruel and Forretress are all set-up bait for the extremely dangerous Extreme Killer Arceus (if Forretress lacks Toxic) and Substitute Ho-Oh, whereas Espeon can never be set-up fodder for anything thanks to its access to Yawn as well as its powerful Psyshock capable of destroying Ho-Oh's Substitute in one hit), but in the case of the Rapid Spin users, they are incredibly unreliable at keeping entry hazards off the field due to the prevalence of some insanely bulky Ghost-type Pokémon in the Übers metagame. Although Espeon has traditionally been used on the Pokémon Online server's DW/No Preview Ubers ladder as a Pokémon to switch directly into the opponent's entry hazard user in order to reflect their entry hazards, Espeon when used in a tier with Team Preview is far better off leading against the opponent's entry hazard setter (provided that entry hazard setter cannot be outrun and KO'd in one hit by another member of the team of course, like in the case of opposing Groudon leads, which can easily be KO'd or forced to switch out by Kyurem-W), as Team Preview raises the risk of the opponent predicting and therefore attacking the Espeon switch-in too high. For example, when faced with a lead Deoxys-A, Deoxys-S or Dialga, it is much safer to simply lead with Espeon and attack the opponent's lead with either Grass Knot or Hidden Power [Fighting] on Turn 1 than to lead with a different Pokémon and predict the Stealth Rock by switching to Espeon for the benefit of getting Stealth Rock down on the opponent's side of the field. For those who are unfamiliar with how Magic Bounce is used in the Übers metagame, the point of this Ability is not to block the opponent's entry hazard setters indefinitely in the same way that a Chansey can block a Palkia indefinitely, or that a Latias can block a Kyogre indefinitely, since both Espeon and Xatu are too frail to do that. The point of Magic Bounce is to temporarily block the opponent's entry hazard setters while weakening them to the point where they can be easily KO'd by most other Pokémon in the team, before the Magic Bounce Pokémon is foddered, and then the opponent is prevented from setting up any entry hazards anyway as their users are then picked off easily due to the team's immense offensive presence (or, even if the opponent does manage to set up entry hazards later, they would not give the opponent as much of an advantage, as the later entry hazards are set up, the less impact they have on a battle). In this way, Espeon's value on this team over Xatu is further highlighted. To serve the aforementioned purpose of weakening the opponent's entry hazard users, Grass Knot is to bring down Groudon the omnipresent Stealth Rock user, Hidden Power [Fighting] is used to weaken Dialga, Tyranitar, Ferrothorn and Forretress, Psyshock is to heavily damage Tentacruel or even eliminate the specially-defensive variants in a single hit, and just serves as a great attacking move in general, and Yawn is a great move with excellent utility. Aside from allowing Espeon to not be set-up fodder for anything, this move also has the benefit of forcing the opponent to repeatedly switch their Pokémon around and either continuously rack up entry hazard damage on their team, or let a Pokémon fall to sleep. Granted, this strategy is not useful if the opponent has a Sleep Talk user or a Magic Bounce Pokémon of their own, but it can still be great at times. And finally, Yawn allows Espeon to perfectly counter Smeargle's Shell Smash + Baton Pass strategy unless the opponent's Shell Smash recipient has Lum Berry. Focus Sash is the item of choice on this Pokémon due to its frailty, and it greatly appreciates the ability to survive at least one turn, especially considering the fact that it often has to take moves such as Groudon's Earthquake and Dialga's Draco Meteor. Aside from blocking status moves and entry hazards, this Espeon with its high Speed and Special Attack also has some utility for offensive or revenge-killing purposes, as it can do some nifty things such as revenge-killing weakened, non-Choice Scarf Palkia and Kyogre. In my opinion, Terrakion is the best Choice Scarf holder in the Übers metagame, being even better than Genesect contrary to popular beliefs. As it is this team's primary check to the dreaded Extreme Killer Arceus, this Terrakion completely lives up to its name, Kamishini no Yari, which literally means "God-Slaying Spear." Because this team lacks the defensive power to wall many offensive threats in the Übers metagame, it relies largely on Terrakion to revenge-kill them. Dragon Dance or Swords Dance Rayquaza, Choice Scarf Kyurem-W, Kyurem-B or Reshiram, weakened Latias, Latios, Choice Scarf Kyogre, Choice Scarf Palkia, Choice Scarf Genesect, Ho-Oh, Dialga, Darkrai, and by far most importantly, Arceus-Normal are all revenge-killed by this beast. And aside from its utility as a revenge-killer, it also often finds itself as an excellent lategame sweeper, as its Close Combat especially tends to clean up amazingly well after the opponent's Ghost-type Pokémon and other Pokémon resistant to Fighting have been eliminated. Because Choice Scarf Terrakion has no good move to use besides Close Combat, Stone Edge and Earthquake, Sleep Talk is chosen as its fourth move in order to give the team a sleep absorber, since relying solely on Espeon to reflect Darkrai's Dark Void is incredibly risky. 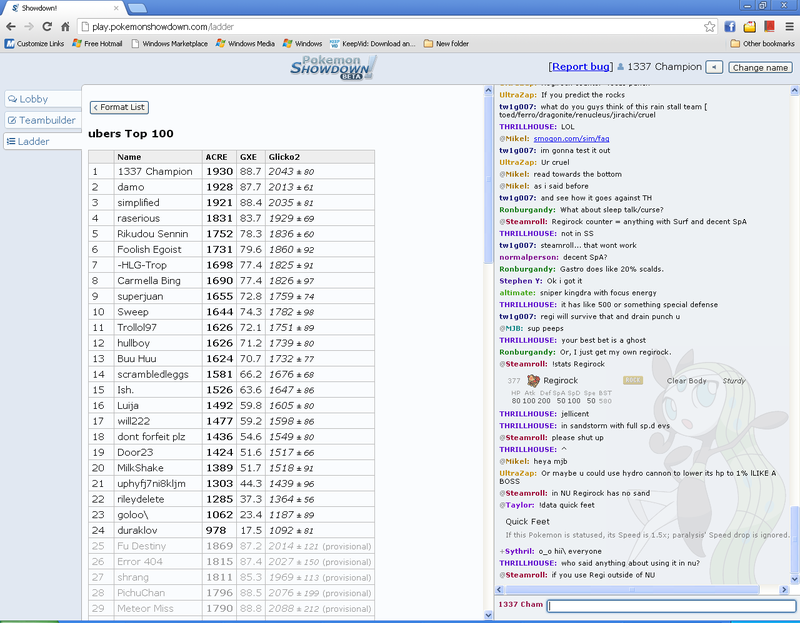 Sleep Talk on Terrakion generally makes Darkrai much easier to deal with. And finally, although one may question the use of Earthquake on this set due to the way it interferes with Sleep Talk by giving Terrakion only a 66.66% chance of selecting the oftentimes much more beneficial Close Combat or Stone Edge, there have been some situations in which Earthquake has been found to be useful, most notably in the fact that Earthquake is Terrakion's only move besides Close Combat that can KO Zekrom in two hits, but due to the Defense drop that this move induces, it would leave Terrakion open to being KO'd by Choice Scarf Zekrom's Bolt Strike or Outrage, whereas this problem would be completely sidestepped with Earthquake. Kokujō Tengen Myō'ō the Groudon is this team's weather summoner, Stealth Rock user, and general support Pokémon, although unlike the other Pokémon in this team, it does not really have anything in common with the Bankai it is named after besides its enormous size. With its specially-defensive EV spread, this Groudon can manage some incredible feats such as surviving a full-health Choice Specs Kyogre's Water Spout in the Sun, taking a non-Life Orb Seed Flare from Shaymin-S, and living two hits from Choice Scarf Kyogre's Surf in the Sun as well as non-Choice Specs Palkia's Spacial Rend. With its ability to summon the Sun upon entry, Groudon also serves a vital role in this team's resistance against Kyogre, as whenever Kyogre comes in against a Pokémon it can easily threaten, Groudon can be switched in to summon the Sun and easily tank a Water Spout, before immediately switched out to Kyurem-W, and while the opponent's Kyogre can barely scratch the Boundary Pokémon in the Sun, Kyurem-W can then give the team offensive momentum by immediately proceeding to threaten the opponent's entire team with its devastating Choice Specs-boosted attacks (more details about this will be provided in Kyogre's section on the Threat List). The 16 Speed EVs on Groudon allow it to outrun most support Dialga and KO them with Earthquake after some prior damage before they can set up Stealth Rock if the situation calls for it, and also ocassionally allows Groudon to outrun Ho-Oh and KO it quickly with Stone Edge. Thunder Wave can be used to paralyze various Pokémon including Kyogre, Palkia and Calm Mind Arceus. The ever so common Choice Scarf Kyogre, which can sometimes be paralyzed when the opponent leads with it against this Groudon, becomes significantly less threatening to this team once it is paralyzed, and by paralyzing a Palkia or a Calm Mind Arceus, the team's Ho-Oh can easily spam Substitute and Roost against them, fishing for an opportunity to catch them fully paralyzed while Ho-Oh has its Substitute up, before proceeding to finish them off with one of Ho-Oh's absurdly powerful attacks, and then forcing the opponent to let yet another one of their Pokémon, such as their Kyogre take a heavy, Life Orb-boosted hit in the process of breaking Ho-Oh's Substitute. In the presence of both Groudon's Drought and Espeon's Magic Bounce support, there is very little reason not to include in this team what is one of the best and most versatile Pokémon in the entire game both offensively and defensively given the aforementioned support. As I strongly believe that the rain stall archetype with defensive Sleep Talk Kyogre, Ferrothorn, Tentacruel and a Ghost-type Pokémon to block Rapid Spin is one of the best and strongest team archetypes in the entire Übers metagame, it is no wonder to my eyes that Life Orb Ho-Oh, a Pokémon which completely tears rain stall apart, is perhaps the single deadliest offensive threat in the Übers metagame next to Arceus-Normal, and therefore a strongly welcome addition to any team featuring the support that it requires to function. With almost nothing in the metagame short of the rare Arceus-Rock that is capable of stomaching the insanely destructive assaults of Life Orb Ho-Oh, combined with its excellent special walling abilities especially in the Sun that allows it to wall and slaughter countless Pokémon including Palkia, Kyurem-W, Reshiram and special attacking Arceus, its ability to set up a Substitute against the myriad of Pokémon that lack the offensive power to break it, and last but not least its access to a 50% recovery move on top of a 33% recovery Ability which allows it to brutally abuse its Life Orb to the maximum potential by mitigating the very recoil which has historically served as the bane of many other Life Orb holders such as Mewtwo and Rayquaza, Life Orb Ho-Oh is a Pokémon which has very often simultaneously played a myriad of significant roles in the teams that I build, and The Blazing Glaciers is no exception. And then of course, there is all the versatility and utility that any Ho-Oh provides with its ability to switch endlessly into Giratina-A until Kyurem-W is dragged out by Dragon Tail or Roar (at which point the opponent is probably forced to sacrifice a Pokémon), absorb Will-O-Wisps, tank Genesect's U-turns, spread burns with Sacred Fire, lure in Kyogre and Brave Birding it, and serve many other useful roles like that, but at this point it seems that there is no need to go through all of that as people seem to already know about it all. Being what is undeniably the best Fire-type Pokémon in the game, there is no question that Ho-Oh ought to be named after the Bankai form of the most powerful fire-element Zanpakutou. As if the inclusion of a Life Orb Ho-Oh in this team wasn't enough, the sheer offensive, wall-breaking power of this team is heightened to the maximum level with the inclusion of Choice Specs Kyurem-W. With the blazing, nuclear strength stored beneath the frozen surface of its body, the icy, yet fiery dragon is able to force opposing Groudon leads to either switch out or risk getting obliterated by its devastating Ice Beam or Draco Meteor, in this way delaying the time when it gets to set up Stealth Rock without Espeon having to even step onto the battlefield. And with its Choice Specs Ice Beam capable of taking down offensive Kyogre in three hits, the most specially-defensive variant of Kyogre's incredibly common partner Ferrothorn in two hits, most Ho-Oh in two hits, and just about every other commonly-used Pokémon in Übers in one to two hits, Kyurem-W is usually capable of blasting huge holes in the opponent's team with very little prediction required unless the opponent packs something like a Tentacruel, Jirachi or Arceus-Steel in their team, and Draco Meteor and Fusion Flare round off its coverage. While many people opt for Focus Blast as Kyurem-W's last move, it is not valued on this team due to its frustrating accuracy and situational use, and Dragon Pulse is much more favored for situations in which Kyurem-W would need to use a Dragon-type move without lowering its own Special Attack to be surprisingly common. For example, Kyurem-W often finds itself in a situation in which it is facing a Kyogre within Dragon Pulse KO range (but not within Ice Beam KO range), while the opponent has a Giratina-A and an Arceus within Dragon Pulse KO range (but not the KO range of a -2 Draco Meteor) in their team. Just like the team's Life Orb Ho-Oh, and to a lesser extent Choice Scarf Terrakion as well, the immense offensive power that Choice Specs Kyurem-W provides for this team is valued not just for its wall-breaking power, but also because such offensive pressure is oftentimes necessary in order to prevent the opponent's entry hazard setters from doing their job, and not allow Espeon's efforts in temporarily blocking the opponent's entry hazards and weakening their entry hazard setters before sacrificing itself go to waste. As Espeon is this team's only immunity to Toxic, Kyurem-W's ability to blast its way straight through Lugia's Multiscale and often fell it in a single blow is also very helpful for this team, as its Toxic-stalling Substitute set can otherwise be incredibly dangerous against this team if it comes in after Espeon has fainted. In fact, the Toxic-stalling Substitute Lugia is one of the biggest reasons why Kyurem-W is used over Palkia in this team despite the fact that the latter gives the team a solid Kyogre check, especially since Espeon is this team's only immunity to Toxic. The second big reason for using Kyurem-W over Palkia is, of course, that Same Type Attack Bonus Ice Beam which enables it to not have to predict between Kyogre, Ferrothorn and Dragon-type Pokémon by choosing between a Dragon-type move and a Fire-type move. This Pokémon is given its name based on the fact that it is an immensely powerful ice dragon, much like Hyōrinmaru itself. The only reason it does not hold the much more fitting name Daiguren Hyōrinmaru is because Pokémon Showdown! does not support Pokémon nicknames of that length. Finally, we have the team's final member, a Swords Dance Arceus-Ghost. Being an Arceus (which is typically the "figurehead" of an Übers team) that boosts its Attack by dancing with swords, is capable of moving at ExtremeSpeed and its main attack is a slashing move, there is no more fitting name for this Pokémon than Tensa Zangetsu, a powerful sword which is the Bankai of the main character of Bleach, that boosts the speed of its wielder to insane levels. Aside from serving as this team's main sweeper, which cleans lategame very effectively after the opponent's team has been sufficiently weakened by The Blazing Glaciers's numerous devastating wall-breakers, this Arceus-Ghost, just like all the other members of this team, has excellent utility for both offensive and defensive purposes, which is exactly what justifies its use in this team over Arceus-Normal, which is far superior as a standalone sweeper. Firstly, because this team's Groudon is specially-defensive rather than physically-defensive, it cannot stomach Terrakion's Close Combat as effectively as most other Groudon, and will be worn down if it takes too many of the Sword of Justice's assaults on the switch, which would be devastating for this team considering its own Terrakion (which could speed-tie with the opponent's Choice Scarf Terrakion, but still...), Ho-Oh, Espeon and especially Kyurem-W are all easily destroyed by Terrakion's devastating attacks. However, especially because Team Preview provides no information about Arceus's type, Arceus-Ghost not only serves as a very great resistance against opposing Terrakion thanks to its immunity to Close Combat, but switching Arceus-Ghost into said move is also a very sweet deal as it gives the Alpha Pokémon a free turn of set up as the opponent switches out their Terrakion, giving this team momentum. Secondly, Swords Dance Arceus-Ghost also pairs very well with this team's Choice Scarf Terrakion for the purpose of dealing with Arceus-Normal, something that will be explained in detail in Arceus-Normal's section on the Threat List. Thirdly, Arceus-Ghost's ability to outrun and KO Latias and Latios in a single hit is invaluable for this team, as those two Pokémon could prove to be very troublesome if they get around Ho-Oh somehow, and this is also the main reason why Arceus-Ghost's Swords Dance set is being used over its Calm Mind set in this team. Basically, although it is not as dangerous a sweeper as Arceus-Normal due to its lack of Same Type Attack Bonus for a +2 priority move, it is this Pokémon's immense contribution to this team's defensive synergy, and Arceus-Normal's lack thereof, which is why Swords Dance Arceus-Ghost is chosen over the standard Extreme Killer for this team. Additionally, it can also get past the great walls Lugia and Giratina far more easily than Arceus-Normal can, which is another big plus. The method by which this team deals with Kyogre is very interesting. As mentioned before, the team does not contain one Pokémon which is capable of completely checking Kyogre by itself, and while many people, including myself in the past would immediately take this as as an indication of a team's mediocracy, the vast success that The Blazing Glaciers has achieved on six different Übers ladders between Pokémon Online and Pokémon Showdown! turns this notion completely on its head. The members of The Blazing Glaciers work together as a team to play around the Sea Basin Pokémon, and the very art of doing so is nothing short of a masterpiece in the eyes of this team's creator. As alluded to several times previously, if a Kyogre comes into an Espeon without its Focus Sash intact, a Terrakion while it is still needed later on in the match to deal with another Pokémon such as an Arceus-Normal, a Ho-Oh without a Substitute up, a Kyurem-W locked into Fusion Flare (although one should be very careful about using this move with Kyurem-W when the opponent has a Kyogre anyway) or a +0 Attack Arceus-Ghost, then the general response is to switch to the team's specially-defensive Groudon. If the opponent's Kyogre fires a Choice Specs-boosted Surf or Hydro Pump, or any form of Water Spout against Groudon on the switch, then the next course of action is to switch to Kyurem-W before immediately regaining offensive momentum by blasting the opponent's team with Kyurem-W's Choice Specs-boosted attacks. If the opponent's Kyogre does not attack Groudon with a Water Spout or any kind of Choice Specs-boosted attack on the switch, Groudon can stay in on the next turn to paralyze the opponent's Kyogre, as Groudon is not KO'd in two hits by any of such moves, and this is often very beneficial considering how much this status effect hinders Choice Scarf Kyogre, the most common moveset for this Pokémon. Or, if the opponent's Kyogre turns out to be a defensive one, Groudon could even set up Stealth Rock in front of it. In any case, if Kyogre does not use Water Spout or any kind of Choice Specs-boosted attack against Groudon on the turn it switches in, Ho-Oh also becomes a viable switch-in against Kyogre on the next turn, as it is not KO'd in two hits by any of Kyogre's attacks in the Sun barring the aforementioned as well as the extremely inaccurate Thunder. Aside from the fact that unlike Kyurem-W, Ho-Oh has reliable recovery in the form of Roost and Regenerator, one other notable advantage of switching to Ho-Oh rather than Kyurem-W to wall Kyogre in the Sun is the former's immunity to a possible Scald burn. If Kyogre comes into Espeon while its Focus Sash is intact, then the best option is to tank a hit with Focus Sash and strike back hard with Grass Knot rather than switching to Groudon and possibly getting it badly damaged, as despite being specially-defensive, the number of times Groudon can switch into Kyogre is limited, and keeping Espeon in to Grass Knot Kyogre not only reduces the number of times Groudon needs to switch into Kyogre by one, but it also eliminates the possibility of Groudon having to tank a Water Spout later on in the match, barring the case of the opponent using the move Wish of course. If Kyogre comes into a Ho-Oh behind a Substitute (either by switching into Ho-Oh on the turn it uses Substitute, or coming in to break Ho-Oh's Substitute after Ho-Oh manages to defeat another Pokémon while having a Substitute up, which isn't uncommon against Pokémon such as Ferrothorn as well as Palkia or Calm Mind Arceus-Ghost in the Sun that were previously paralyzed by Groudon), then it is smashed for a huge amount of damage, and possibly KO'd in a single blow by the phoenix's Life Orb Brave Bird.If the opponent's Kyogre comes into Kyurem-W locked into any move besides Fusion Flare, then Kyurem-W will just stay in to attack it, as even its Ice Beam KOs offensive Kyogre in three hits. If Kyogre comes into Arceus-Ghost while it has used Swords Dance at least once, then Arceus-Ghost will just stay in to ExtremeSpeed Kyogre, or Shadow Claw it if it is known that the opponent's Kyogre does not have Choice Scarf. If the opponent's Kyogre comes directly into Groudon, or another Pokémon it can easily threaten while Groudon is low enough on health to not be able to take an attack, then a Pokémon in the team will need to be sacrificed in order to bring either Groudon or Kyurem-W safely into Kyogre. That Pokémon to be sacrificed is usually Espeon, but if it has already fainted, then the Pokémon to be foddered must be chosen wisely by looking at the opponent's remaining Pokémon. If it has reached a point in a match in which one's Groudon is weakened enough to not be able to switch into Kyogre, then chances are the opponent has also lost at least one or two Pokémon, or at least have them weakened. The holes that have been created in the opponent's team so far should then be taken as an indication of which Pokémon in the team should be sacrificed. For example, if the opponent's Darkrai and Arceus-Normal are the ones that have fainted, or if the opponent's team contains Arceus-Ghost or other Pokémon which Terrakion would not be too helpful against, then the logical choice would be to sacrifice Terrakion, and if the opponent has Skarmory in their team, then it follows that Arceus-Ghost would not be too helpful for the rest of the match, so it should be switched into Kyogre in such a case. While being forced to sacrifice a Pokémon against the most common Pokémon in the entire game (if all Arceus types are counted separately) may make the strength of this team seem questionable in the eyes of many, do note that The Blazing Glaciers is an offensive team, and therefore having to make sacrifices is nowhere near as detrimental for this team as with stall or balanced teams. In fact, this team very often hinges on the very act of sacrificing one Pokémon in order to safely bring in another and maintain offensive momentum. There are also numerous other notable strategies that this team employs when facing Kyogre, the most obvious of which is, of course, luring it in with Ho-Oh and smashing it to pieces with Brave Bird on the switch. Choice Scarf Terrakion can also be used to revenge-kill weakened Kyogre, as easily as Kyogre may just switch out. And finally, one very interesting strategy that could be used lategame is switching a weakened Groudon into Kyogre to summon the Sun and then fodder Groudon (which, especially lategame, is not too detrimental considering Ho-Oh is the only Pokémon in the team that is hindered significantly by the absence of sunlight - Kyurem-W surprisingly does not get the chance to use Fusion Flare that much for some reasons), before immediately sending out Arceus-Ghost on the next turn to set up against Kyogre in the Sun, and this usually means defeat for the opponent, as Swords Dance Arceus-Ghost cleans up incredibly well lategame. Also, note that if one has a Kyurem-W out against the opponent's Kyogre and the opponent has a Ferrothorn in their team while Kyurem-W is not yet locked into any move, then the most beneficial move to use in such a case is usually Ice Beam. It is extremely detrimental to have Kyurem-W locked into a Dragon-type move against Ferrothorn, and even more so to have it locked into Fusion Flare against Kyogre in the rain, whereas using Ice Beam tends to create a win-win situation as it heavily damages both Pokémon. Lastly, it should be mentioned that Kyurem-W can more or less safely switch into defensive Kyogre even in the rain. If one is still not sure about how this team is meant to handle Kyogre despite reading everything mentioned above, then they should take their time to study the replays listed above. Before immediately dismissing the merits of this team just because it needs to rely on such a convoluted method to deal with Kyogre, do remember that this team peaked at #1 on the Pokémon Online server's DW Ubers ladder with 1750 points back when it had Reshiram (a Pokémon which, unlike Kyurem-W, gets outrun and one-hit KO'd by the extremely common Choice Scarf Kyogre) over Kyurem-W. While not quite as complex as the way by which this team deals with Kyogre, it also handles Arceus-Normal in a very interesting way. Obviously, Choice Scarf Terrakion is this team's main check to that dreaded sweeper, but little do many people realize that even the frailest variant of Extreme Killer Arceus can survive a Jolly Close Combat from Choice Scarf Terrakion. As such, many teams that rely on Choice Scarf Terrakion to check Arceus-Normal could fall flat on their faces to this very Pokémon, but The Blazing Glaciers's Arceus-Ghost ensures that even if Terrakion fails to revenge-kill Arceus-Normal, the opponent's Alpha Pokémon would not be able to sweep anyway, as it can just waltz right in after Terrakion has fainted and then finish off the opponent's weakened Extreme Killer Arceus with either Brick Break or ExtremeSpeed, depending on the amount of health they have left after taking a Close Combat. If the opponent's Arceus-Normal was taken down to ExtremeSpeed KO range by Close Combat, then it is a fast and frail variant and should be revenge-killed with ExtremeSpeed in case of a speed-tie, but if Arceus-Normal is not within ExtremeSpeed KO range, then it is a slow and bulky variant and therefore can be safely outrun and finished off by Brick Break. Also, if the opponent's +2 Extreme Killer Arceus chooses to take down Terrakion with two ExtremeSpeeds rather than a single boosted Brick Break or Earthquake, which is often the case, then provided the opponent does not yet know of this team's Arceus type, then one can even save Terrakion from certain doom by switching straight to Arceus-Ghost on the second ExtremeSpeed, allowing Terrakion to be used later on in the match to deal with other Pokémon like Darkrai, Kyurem-W or Dragon Dance Rayquaza. This can be clearly demonstrated in the replay of the battle against Exeggutor and BlackWallStreet listed above. Also, because of the very presence of Arceus-Ghost in this team, it can oftentimes beat Arceus-Normal without Terrakion even having to step onto the battlefield at all. If one can hit Arceus-Normal with an insanely powerful attack like Kyurem-W's Draco Meteor (or even one of its other three attacks against frailer variants if they have taken Stealth Rock damage before) or Ho-Oh's Sun-boosted Sacred Fire (Lum Berry variants of Arceus-Normal don't mind setting up on Ho-Oh) during the turn it sets up, Arceus-Ghost can also be switched into the inevitable ExtremeSpeed on the next turn and KO the opponent's Arceus-Normal, essentially making the opponent's Extreme Killer Arceus go to waste, by rendering it unable to deal any damage whatsoever before fainting. And finally, Groudon with its naturally high physical bulk could also serve to take a boosted ExtremeSpeed and finish off a weakened Extreme Killer Arceus with its Earthquake if the situation calls for it. Though it may be tempting to lead with Kyurem-W upon seeing that Groudon is obviously the opponent's Stealth Rock user from the Team Preview, a surprising number of people actually anticipate this move, and therefore lead with something like a Palkia or a Latias, meaning that leading with one's own Groudon may be the better choice. Nevertheless, Groudon is not too threatening to this team as Espeon is here to block its Stealth Rock and heavily damage it with Grass Knot, which knocks Groudon down to the KO range of the attacks of many of this team's members, ensuring that it will not be able to set up Stealth Rock for the rest of the match even after Espeon faints. This team's Choice Specs Kyurem-W also very easily takes advantage of opposing Groudon due to its ability to KO the Continent Pokémon with either Draco Meteor or Ice Beam, which forces the opponent into a situation in which they must sacrifice a Pokémon if they do not predict correctly. Offensive Groudon could be troublesome, but with The Blazing Glaciers's high offensive pressure, a Groudon of its own which can take even a boosted Earthquake from an opposing Groudon, as well as a user of ExtremeSpeed in Arceus-Ghost for Rock Polish sweepers, it is not too big of a problem. Though nothing in the team can safely switch into it, it cannot set up on anything either except for Terrakion locked into Close Combat, as Kyurem-W, Ho-Oh and Arceus-Ghost can all KO it in one hit, Espeon can Yawn it, and Groudon can paralyze it. Even if Mewtwo does get a chance to set up against Terrakion, Arceus-Ghost can take even a +1 Life Orb Psystrike and KO it with Shadow Claw, Groudon can usually survive even a +1 Life Orb Ice Beam and paralyze Mewtwo, and Espeon with its Focus Sash intact can take a hit and force Mewtwo to switch with Yawn. The combination of Stealth Rock, Life Orb recoil and any damage that Mewtwo takes while setting up also easily knocks it into KO range by Terrakion's Stone Edge, Arceus-Ghost's ExtremeSpeed, or a combination of the two. The switch-in to Palkia depends on which weather is up. If the heavens are not filled with harsh sunlight, Groudon will be switched into Palkia to paralyze it, before being switched out to Ho-Oh. Otherwise, Ho-Oh easily walls it in the Sun. Ho-Oh could even spam Substitute and Roost against a paralyzed Palkia and fish for the 25% chance of Palkia being fully paralyzed, until Ho-Oh can KO Palkia while having a Substitute up, which forces the opponent to let another Pokémon in their team, such as their Kyogre take a huge hit in the process of breaking Ho-Oh's Substitute. Terrakion can also revenge-kill weakened Palkia. If one feels like taking a risk, they could try to reflect Dark Void with Espeon. Either way, if Darkrai predicts the Espeon switch-in and brings the Sun Pokémon down to its Focus Sash, Terrakion should be sent in next. If Terrakion gets a Justified boost upon switching into a Dark Pulse, its Stone Edge becomes strong enough to KO Darkrai in one hit anyway, so it may be the best move to use in such a situation if the opponent also has a Ghost-type Pokémon or a Mewtwo in their team. Because Terrakion has Sleep Talk, the only move it really has to be wary of when switching into Darkrai is the inaccurate Focus Blast. Either way, after a Pokémon has been put to sleep, Ho-Oh destroys Darkrai very easily. Walled by Ho-Oh, and to a lesser extent, Arceus-Ghost. Espeon reflects any Stealth Rock, Spikes, Leech Seed, Thunder Wave or Toxic it may attempt and weakens it with repeated Hidden Power [Fighting]s, or Ho-Oh could be switched in in anticipation of a Gyro Ball or Power Whip. With Terrakion's Close Combat and two very powerful Fire-type moves in this team, Ferrothorn is hardly a problem. Opposing Ferrothorn also often find themselves losing more than half of their health by switching into Kyurem-W's Ice Beam while anticipating a Dragon-type move aimed at their Kyogre or Dragon-type Pokémon. Lategame after Espeon has fainted, it is sometimes even worth it to let opposing Ferrothorn set up entry hazards if it means allowing Ho-Oh to get a free Substitute, which sometimes means securing a KO against at least two of the opponent's Pokémon. Espeon always leads against Dialga leads and weakens Dialga with two Hidden Power [Fighting]s while blocking Stealth Rock on those two turns, before foddering Espeon. After that, Dialga can be easily KO'd by any Pokémon in the team before it can set up Stealth Rock. Special attacking variants of Dialga are all easily dealt with by Ho-Oh and to a lesser extent, Groudon, while Terrakion can revenge-kill them. As for Bulk Up Dialga, it takes massive damage from Terrakion's Close Combat and Ho-Oh's Sun-boosted Sacred Fire even after boosting, and it is also very easily threatened by Kyurem-W's devastating Draco Meteor. Against Shell Smash recipient Dialga, Espeon switches into Smeargle on the turn when it Shell Smashes, before Yawning the opponent's Dialga on the turn they receive the Shell Smash boosts, in this way putting a stop to its sweep unless it carries Lum Berry. Although, even assuming that Dialga does have this item and therefore gets past Espeon, it is not going to KO Groudon (barring the extremely rare Ice Beam) or Arceus-Ghost in one +2 hit anyway, and also only has a very small chance of KOing Ho-Oh with a +2 Thunderbolt (and if it opts for Thunder, that move only has 50% accuracy in the Sun). It cannot set up on anything barring Kyurem-W or Terrakion locked into the wrong move. Arceus-Ghost can take a hit from it, set up a Swords Dance, and slay the Sky High dragon with a single Shadow Claw after Stealth Rock. Groudon can also switch into any set and it and paralyze or Stone Edge it, if one does not feel like running the risk of sacrificing their Ho-Oh against it. Terrakion revenge-kills both Swords Dance and Dragon Dance Rayquaza provided the latter does not get more than one boost, which will pretty much never happen. Pretty much the same deal as Ferrothorn, except slightly more annoying due to Sturdy, its lack of weakness to Fighting, and ability to beat Swords Dance Arceus-Ghost by using Pain Split and Toxic. Nothing in The Blazing Glaciers can safely switch into it, but this team mainly utilizes a combination of Stealth Rock and offensive presence to wear it down. The Stone Edge of Terrakion as well as this team's Speed-creeping Groudon can KO it or force it out, both of which is good if Stealth Rock is down, while this team's Speed-creeping Ho-Oh can outrun most other Ho-Oh and KO them with a Life Orb Brave Bird after just a bit of prior damage, and Kyurem-W can deal massive damage to Ho-Oh with Draco Meteor, and even KO all but the most specially-defensive variants with a single Ice Beam after Stealth Rock. One trick that this team employs against Ho-Oh involves sending out a Terrakion against a Ho-Oh that does not have a Substitute up after another Pokémon has fainted (or on a predicted Roost), and then immediately switching to Kyurem-W while the opponent switches to Groudon, and gain momentum from there. Unless the opponent's Ho-Oh is specially-defensive, they cannot just switch back to their Ho-Oh at that point even if Stealth Rock is not on their field, as it will get blasted down by two Ice Beams. Espeon completely walls any variant that does not have any attacking moves, and with Yawn, it can also either stall out Deoxys-S's Reflect and/or Light Screen, or force the opponent to let a Pokémon fall asleep. However, those that can attack could be troublesome. Against Fire Punch Deoxys-S, the trick is to Grass Knot it twice while surviving two Fire Punches, before switching to Ho-Oh to absorb the third Fire Punch (whose damage is easily negated by Regenerator), and then, having lured the opponent's Deoxys-S into using Stealth Rock on that turn, switching back to Espeon to reflect that entry hazard. If done correctly, the opponent's Deoxys-S should not be able to switch out without succumbing to Stealth Rock damage the next time it comes in, enabling it to be revenge-killed by Arceus-Ghost or Terrakion after Espeon is foddered, without having to face the possibility of it switching out and then coming back in later to set up hazards (keep in mind this strategy will not necessarily work against an opponent one has battled before though). Deoxys-S with Dark Pulse or Shadow Ball could be troublesome, as although they can be revenge-killed by Terrakion, they can simply switch out. They would probably eventually be able to get hazards up in most matches, though considering the combined efforts of Espeon and Terrakion delays the time when they accomplish this task, as well as the fact that teams with Deoxys-S are rarely stall teams, this is not too much of a problem. When an Arceus-Ghost is seen, the first Pokémon to switch to is Groudon, and Arceus-Ghost should be paralyzed regardless of whether it uses Calm Mind or Swords Dance. Calm Mind Arceus-Ghost is hardly a threat, as regardless of whether or not it is paralyzed, it is easily stomped by Ho-Oh. Swords Dance Arceus-Ghost are much more problematic though, due to their inability to be beaten easily by Ho-Oh. Against Shadow Claw users, the plan is to paralyze it, weaken it as much as possible with Groudon's Earthquake, and then fodder a Pokémon before revenge-killing with either Ho-Oh's Sacred Fire or Arceus-Ghost's Shadow Claw. Against Shadow Force Arceus-Ghost, there is a very effective strategy against it: After Groudon tanks a +2 Shadow Force and paralyzes Arceus-Ghost, this team's Arceus-Ghost can then be switched in to the impending ExtremeSpeed, before proceeding to Shadow Claw the opponent's Alpha Pokémon for more than 50% damage. After that, as the opponent's Arceus-Ghost vanishes once more in preparation for a second Shadow Force, a Pokémon has to be foddered, before this team's Arceus-Ghost is brought in to finish the opponent's Arceus-Ghost with a second Shadow Claw. Because of the chance that the opponent's Arceus-Ghost may be fully paralyzed, it may sometimes not even be necessary to sacrifice any Pokémon against a Shadow Force user. Ho-Oh switches infinitely into its Dragon Tails until Kyurem-W is dragged out, at which point the opponent will probably lose a Pokémon. Despite this team's Groudon being specially-defensive, it can take even a Life Orb-boosted Earthquake quite well, while of course, taking away Excadrill's beloved sandstorm at the same time and threatening Excadrill with its own Earthquake. When a sandstorm is not raging, Kyurem-W and Terrakion destroy it easily. Mold Breaker variants with Stealth Rock are an incredibly huge pain as expected, but even it can be hard-pressed to set up Stealth Rock early on in a match due to the number of Pokémon in this team that can threaten it. Ho-Oh can easily switch into and wall any Kyurem-W except for the Choice Specs set, against which a sacrifice must be made... but hey, just how many teams are there which don't need to sacrifice a Pokémon every time a Kyurem-W comes in anyway? With Stealth Rock, as well as Terrakion's ability to revenge-kill this blazing, yet icy monster, Kyurem-W can be prevented from netting too many KOs against this team. While Ho-Oh cannot switch into Choice Specs Kyurem-W, it can beat it one-on-one in the Sun, as even with its enormous 125 base HP, a single Life Orb and Sun-boosted Sacred Fire will instantly melt the frozen dragon. Non-Choice Scarf Zekrom are outpaced and destroyed by Kyurem-W. Groudon can quite safely switch into Choice Scarf variants to paralyze them and hit them hard with Earthquake, and Terrakion can survive a hit from Choice Scarf Zekrom while bringing it to its knees with two Earthquakes, or simply revenge-kill it with another move if it is weakened. Despite Zekrom's hatred of being burned, it does switch into Ho-Oh quite often due to its resistance to both Brave Bird and Sacred Fire, giving Ho-Oh many opportunities to burn it with Sacred Fire either on the switch or on the turn when it breaks Ho-Oh's Substitute, at which point it becomes a non-threat. Against Stealth Rock leads, Espeon tanks a Dark Pulse or Shadow Ball from it on Turn 1 using its Focus Sash, while bringing Deoxys-A down to its own Focus Sash with Grass Knot. Then Espeon is switched out to Ho-Oh to absorb a second Dark Pulse or Shadow Ball, which fails to outdamage Regenerator. Espeon is then sent right back in as the opponent is lured into using Stealth Rock, and if they do use that move, their Deoxys-A cannot switch out without fainting from Stealth Rock the next time it comes in, allowing it to be safely revenge-killed by Arceus-Ghost or Terrakion. Keep in mind that this strategy may not necessarily work against a person one has battled against before though. Even if this strategy fails and the opponent does not use Stealth Rock on Turn 3 as planned, not everyone will switch their 1 HP Deoxys-A out against the Arceus-Ghost that comes in after Espeon has fainted, as not only is Calm Mind Arceus-Ghost far more common than Swords Dance Arceus-Ghost (meaning most of them do not have ExtremeSpeed, and not even every Swords Dance Arceus-Ghost uses ExtremeSpeed), but Arceus-Ghost is also generally an incredibly threatening Pokémon which no sane person would want to give a free turn to. As with Deoxys-S, Deoxys-A is almost never used on stall teams, so it would not be too bad even if they get hazards up, especially since the time when they are able to do so will be delayed. As for Life Orb and other variants of Deoxys-A, they can be easily revenge-killed by both Arceus-Ghost and Terrakion, and though Ho-Oh is not exactly a safe switch-in, it can typically tank a hit from even Life Orb Deoxys-A and retaliate with any move for an instant KO. 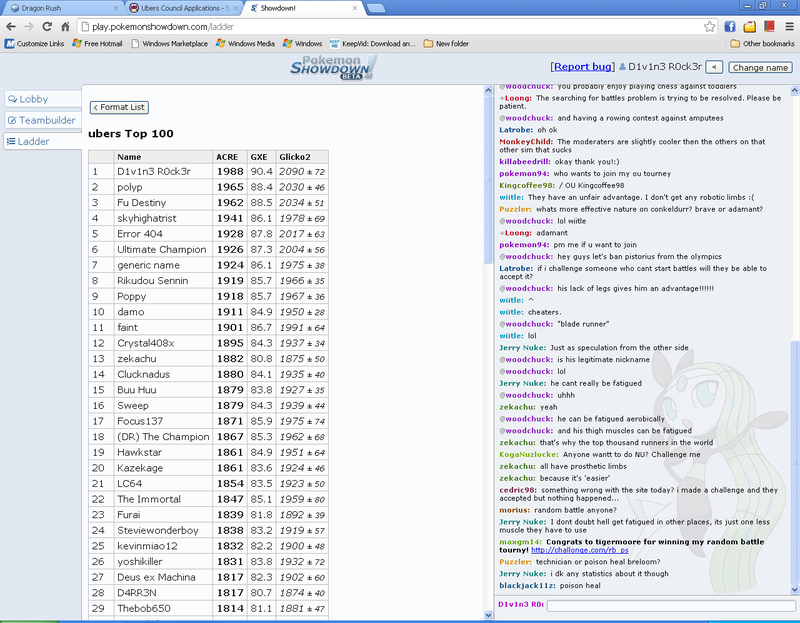 Cannot set up on anything, as even Kyurem-W's Ice Beam knocks it down to the KO range of Arceus-Ghost's ExtremeSpeed. If the situation calls for it, Espeon can tank a hit with Focus Sash before KOing with Psyshock. If the opponent has yet to know the type of this team's Arceus, Terrakion can be sent in against Blaziken, only to be immediately switched out into Arceus-Ghost, making Blaziken crash with Hi Jump Kick, which weakens it to ExtremeSpeed KO range. Even if it means foddering a Pokémon with this team, Blaziken can generally weaken itself to ExtremeSpeed KO range very easily with Life Orb and Flare Blitz recoil. Though the team has no safe switch-in to it, Arceus-Ghost can outrun and KO it in one hit with Shadow Claw, and Ho-Oh also beats it one-on-one. It is also often paralyzed by Groudon's Thunder Wave on the switch, enabling Ho-Oh to switch into even a Psyshock before vaporizing it instantly with Brave Bird, and also enabling Kyurem-W to outrun and KO it. Exactly the same as Latios, except it is significantly easier to handle due to its lesser offensive presence. Can be an incredibly annoying Pokémon if it manages to get a free Substitute, but do note that Groudon can survive a non-Life Orb Seed Flare from it while easily KOing it with Stone Edge in return, so switching Groudon out upon seeing it, and therefore giving it a free Substitute on that turn is not necessarily the best idea. Arceus-Ghost can wear down the Substitute + Leech Seed Shaymin-S with repeated ExtremeSpeeds, though it tends to get heavily damaged if not KO'd in the process. Upon seeing a Shaymin-S from the Team Preview, it is also a wise idea to try to paralyze it on the switch with Groudon, at which point Shaymin-S completely ceases to be a threat. As long as Shaymin-S does not get a free Substitute, it will be hard-pressed to accomplish anything without resorting to aiming for repeated flinches with Air Slash. Just like every other team, this team cannot handle a Choice Scarf Shaymin-S if it gets insanely lucky, but Ho-Oh with its enormous Special Defense usually does a good job at tanking its hits and destroying it. Lead with Terrakion against it, and then double switch to a Pokémon with a favorable matchup against their switch-in to Terrakion, which is almost always a Giratina Forme, meaning that the Pokémon one should double switch to is almost always Kyurem-W, which should either Ice Beam on that turn in anticipation of a Ferrothorn switch-in (sand teams almost always have one), or Draco Meteor in anticipation of the opponent sending Tyranitar back out. Tyranitar is surprisingly easy for this team to wear down, due to its tendency to switch into Ho-Oh, as expected of one of the few Pokémon resistant to both Brave Bird and Sacred Fire. However, what many people do not realize is that Leftovers is not the only item in the world that Ho-Oh is capable of holding - while Tyranitar can stomach the attacks of a Leftovers Ho-Oh quite comfortably, the brutal assaults of a Life Orb Ho-Oh will wear down Tyranitar incredibly quickly, especially when combined with possible Stealth Rock and burn damage, making the weather war incredibly easy to win against Tyranitar-based sand teams. Furthermore, not only do people generally never anticipate Espeon switching into Tyranitar to reflect its Stealth Rock, but after Espeon is sent in, the opponent's Tyranitar typically goes for Pursuit, which Espeon survives, rather than Stone Edge or Crunch. In this way, not only does the opponent's Tyranitar get significantly weakened by Hidden Power [Fighting] (a move that they never expect), but even if they do switch out of the second Hidden Power [Fighting] in order to get a chance to use Stealth Rock later (at which point they get further weakened by the Stealth Rock that they set up upon themselves), Espeon can come in to block the move once more. Groudon and even Terrakion itself comfortably take its Stone Edge, while Arceus-Ghost can easily switch into its Close Combat, especially if the opponent does not know this team's Arceus type, and set up a free Swords Dance. If Ho-Oh defeats a Pokémon while having a Substitute up, it also lures Terrakion in to break its Substitute like nothing else, allowing the Rainbow Pokémon to shatter the Sword of Justice with a powerful Brave Bird. Kyurem-W eats Tail Glow variants alive, while with Groudon's ability to easily come into a +0 Manaphy due to its great special bulk, and therefore summon the Sun, it is also easy to bring Ho-Oh in against a Calm Mind Manaphy in the Sun, and destroy it one-on-one. Arceus-Ghost can also set up on Manaphy in the Sun, though it has to be wary of a possible Scald burn. The combination of specially-defensive Groudon with Stone Edge (combined with Thundurus's tendency to Taunt Groudon in anticipation of Stealth Rock rather than going for the Grass Knot right away), Arceus-Ghost's ExtremeSpeed, and Espeon's ability to reflect Thunder Wave deal with the Electric genie quite well, though it can still be quite annoying at times, especially if it successfully predicts an Espeon switch-in. Countered by Ho-Oh unless it has the rare Stone Edge. Terrakion easily revenge-kills it, and Kyurem-W also outruns and destroys any set barring Choice Scarf or Speed boosts via Flame Charge or Tailwind. Even Groudon can survive a non-Life Orb or Choice Specs-boosted Blue Flare if need be thanks to its specially-defensive build.